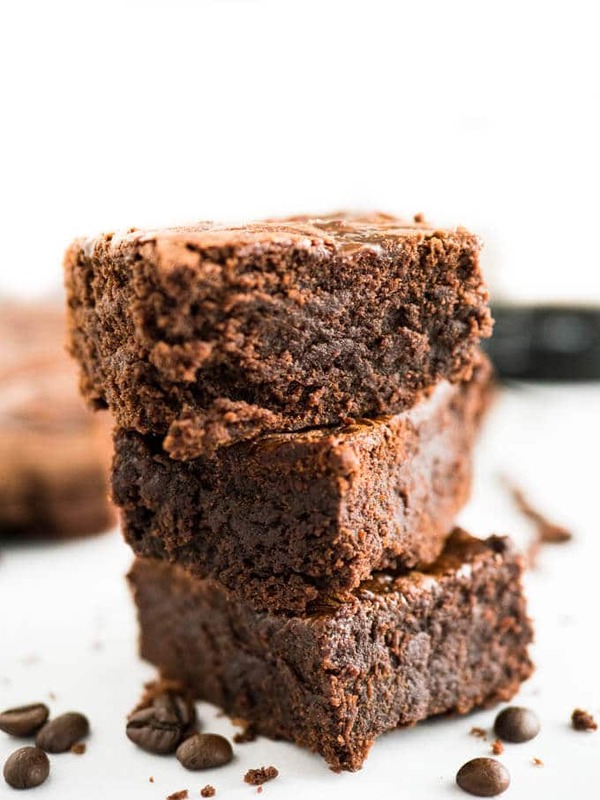 Cold Brew Coffee Brownies are rich, super fudgy, and made with cold brew coffee which takes the chocolate flavor to a new level! These tasty brownies satisfy all your caffeine and chocolate cravings! I have a new obsession: Cold Brew Coffee. It’s an easy way to make iced coffee in the morning but also to make delicious things like brownies. 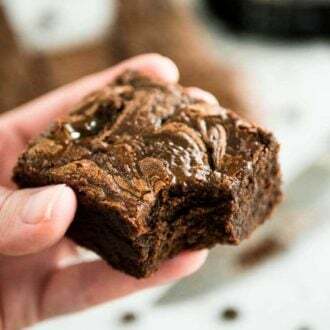 My Salted Caramel Pretzel Brownies with Nutella are really tasty but if you’re more of a semi-sweet chocolate kind of person who loves coffee you need this coffee brownie recipe in your life. Before discovering cold-brew coffee, I made myself a cup of coffee every morning using my capsule machine. But often I ran out of capsules or I wanted a cold coffee and didn’t have enough ice cubes. I was also the only one in our house who drank coffee, my husband thought he didn’t like it and so buying a “real” coffee machine wasn’t on my list. I never thought that it would be so easy to make coffee for a whole week! I buy whole coffee beans and grind them in my Thermomix (30 secs on speed 8) but you can also use ground coffee (you can also get special grounds for french presses which are coarser and perfect for making cold brew coffee). Then I combine the ground coffee with filtered water and let it sit for 8-12 hours. That’s the hardest part! 12 hours later you just have to flip the switch down and the coffee concentrate gets dispensed through a filter into the glass pitcher. You get about 14 servings of coffee out of this. For each cup or glass, you need 2 oz. of concentrate and then you fill up your glass with hot milk or water or if you prefer iced coffee use cold milk and a few ice cubes. The concentrate is also great for baking or cooking. Where recipes call for strong brewed coffee like in some chilies or baked goods you can substitute with cold brew concentrate. I’m a big brownie lover and adding coffee to your favorite brownies makes them even more chocolatey. 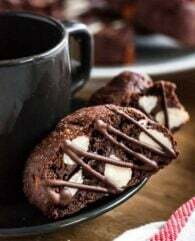 I experimented a bit with the right amount of coffee and this delicious mocha brownie recipe is what came out! 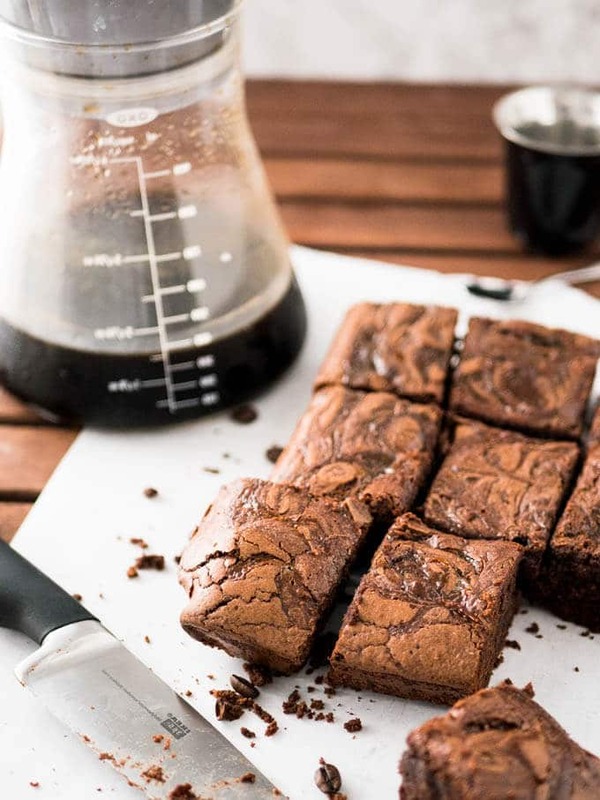 These cold brew coffee brownies are the best brownies I ever had. They are so moist and chocolatey. You can taste the cold brew concentrate but it’s not overwhelming, even people who are not coffee fans will love these! 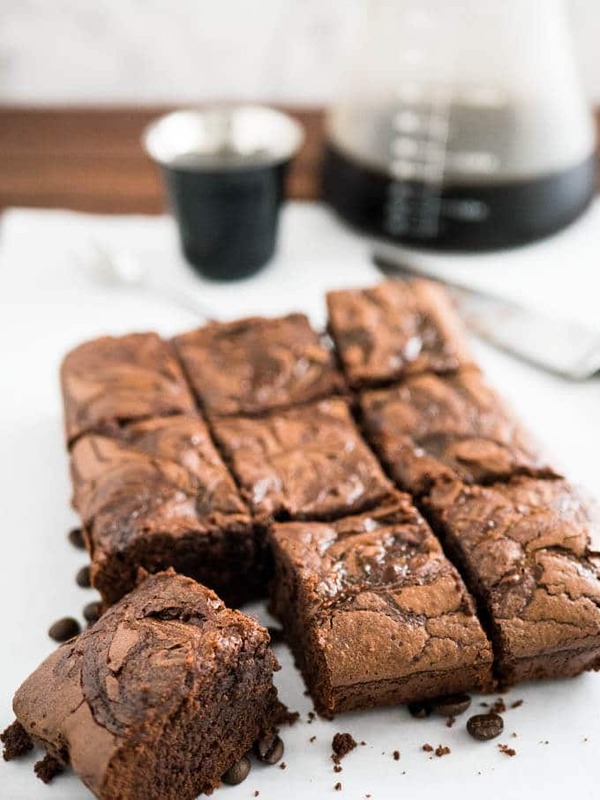 The coffee gives the brownies a deeper chocolate flavor! 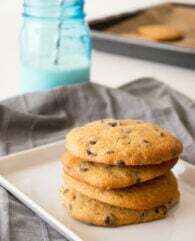 They’re not too sweet which also helps to intensify the chocolate flavor. I added a little caramel sauce on top of my coffee brownies to make them prettier but also because I’m a big fan of Caramel Macchiatos and I love the combination of caramel and coffee. And who doesn’t love some pretty caramel swirls on their chocolate brownies? You can use store bought Cold Brew Coffee Concentrate for this recipe or make your own. makes the process really easy but you can also use a simple Mason jar and a fine-mesh sieve to make your own if you just want to try it out. This article is really helpful to get started with cold brew coffee. Now I’m addicted to cold brew coffee and I need you to try making your own. You will thank me later! Cold Brew Coffee Brownies are rich, super fudgy, and made with cold brew coffee which takes the chocolate flavor to a new level! 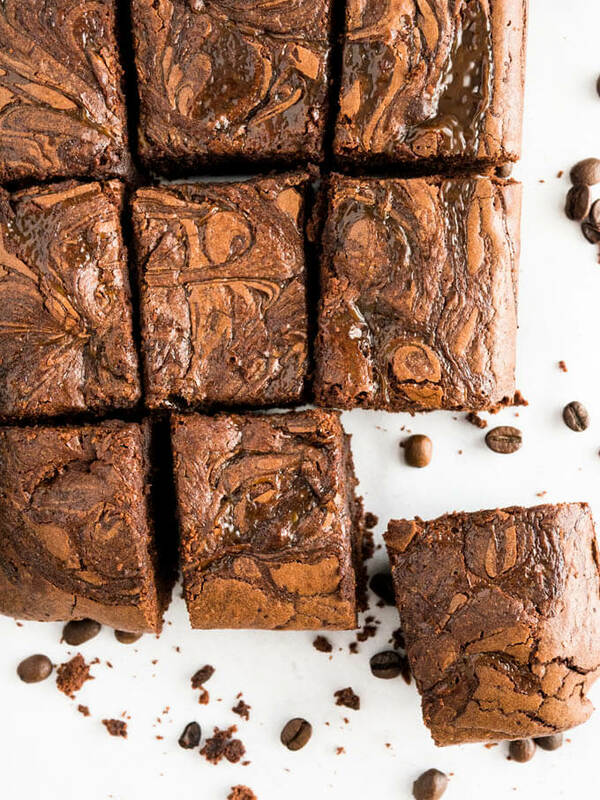 These tasty brownies satisfy all your caffeine and chocolate cravings. Coarsely chop the chocolate and melt it together with the butter in a saucepan over medium heat while stirring constantly. Remove from the heat, pour in a mixing bowl, and let cool for 8-10 minutes. 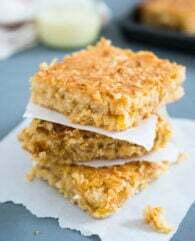 Preheat your oven to 350°F (180°C) and line a 9-inch square pan with parchment paper. Add the sugar to the chocolate mixture and whisk until well incorporated. Add the eggs, one at a time. Whisk in the vanilla extract and cold brew coffee concentrate. Add the flour, cocoa powder, and salt and gently fold them in. Mix only until everything is incorporated and the dry ingredients are wet and no clumps remain. Spread the batter into your prepared pan. If you use the caramel sauce, drizzle it on top and use a fork to make swirls on the surface of the batter. Bake for 30-35 minutes until a toothpick comes out with only a few moist crumbs attached and the brownies pull away from the edges of the pan. Let the brownies cool in the pan on a wire rack. Store the brownies in an airtight container in the fridge for up to one week or freeze them for up to 2 months. Coffee and brownies = winner! These looks amazing Julia! I’ve been wanting to try cold brew coffee for a while – cafe espressos get too expensive and I don’t have a coffee machine -and a recent trip to Vietnamese showed me how good iced coffee can be! 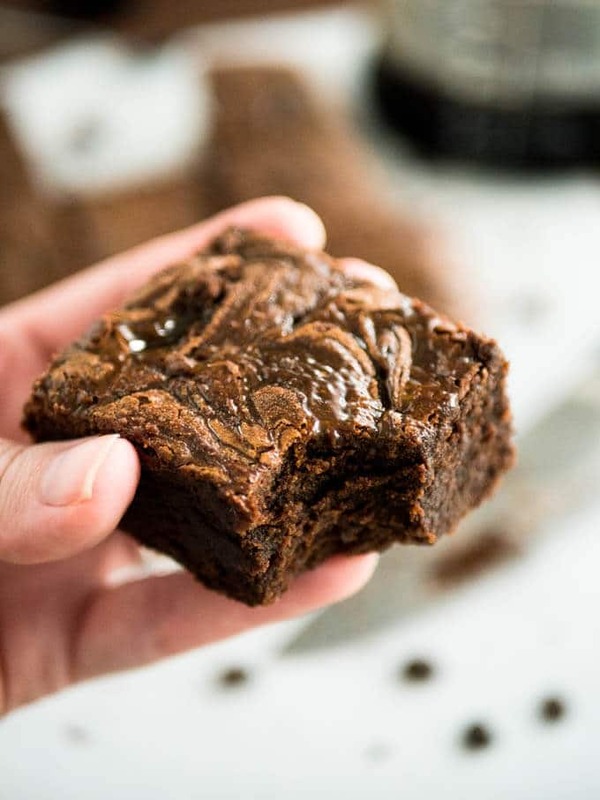 Love how you have incorporated into these brownies as well, and the salted caramel addition sounds heavenly.